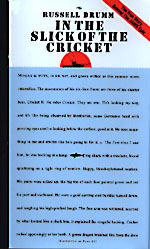 The first time I saw him," In the Slick of the Cricket says at the start, "he was hacking at a hanging shark with a machete, blood splattering on a tight ring of tourists. Happy, blood-splattered tourists. His pants were rolled up, the big toe of each foot painted green and red for port and starboard. He wore a gold earring and bush hat turned down, and laughing his high-pitched laugh. The free arm was withered, scarred by what looked like a shark bite. It explained the vengeful hacking." The shark-hacker here is the well-known Frank Mundus, the charter-boat captain who sailed out of Montauk on Long Island for 40 years and was thought to be the model for the monomaniacal Quint in the novel Jaws, although its author, Peter Benchley, has never acknowledged any debt, apparently somewhat to the resentment of Mundus, who is reported to have said he never read the book. The writer is Russell Drumm, a reporter for The East Hampton Star whose beat is the waterfront. The occasion for the description was a five-day trip aboard Captain Mundus's Cricket II in July 1990, shortly before Mundus was to retire with his wife to the Kona coast of Hawaii, where instead of killing great white sharks he planned to grow tropical fruit. Drumm went to sea somewhat in the spirit of Melville's Ishmael when that character finds himself "bringing up the rear of every funeral I meet." Drumm was haunted by the suicide of a young fisherman whose obituary he had written, which made him feel "like a tourist just visiting my one and only, flash-in-the-cosmic-pan, life." He adds: "There were mountains to climb, but I never would, faraway places with old romantic hotels I would never wake a wild lover in. ... Slowly, I'd lowered my sights like the rest of the wretches in this overpopulated world." So at least he might witness Captain Mundus catching his last great white. Do they get their fish? No, they do not. They catch other kinds of sharks but not one of the monsters that Captain Mundus helped to make famous. This is a somewhat disappointing outcome to a trip that Drumm describes as feeling "fated for something." But then such disappointment is in the spirit of this eloquently caustic, faintly apocalyptic account, which not only describes the passing of an age but also foresees the destruction of an environment. Time and again in his despair over the earth's ruination, Drumm evokes the theme of Noah's flood, even noting one time when two city pigeons landed on the Cricket, "the flood story backwards, reversed polarity." He writes: "In recent times, God has realized there is no need to go back on the old promise He'd made to Noah. The tiring task of taking every living substance and removing it from the face of the Earth had become necessary once again, but was being handled nicely by the bipedal convenience monster." Still, if Drumm doesn't get his fish, he does get his man -- talking and talking in his Brooklyn accent. (Once, Mundus refers to "the pernt of no retoyn.") While reminiscing about his battles with great whites, including one that weighed some 4,500 pounds, Mundus reveals that behind his cranky exterior there lies the sort of guy who tells overbearing fathers to shut up -- "I'm the captain here" -- and then takes their children aside and says to them, "If you listen to them long enough, they'll tell you what they don't know." Mundus named his boats after Jiminy Cricket because people told him he looked in profile like the character in the film Pinocchio, which, "with sloping forehead and his Roman nose," Drumm adds, "he does." The slight withering of his arm was caused not by a shark but by a childhood roller-skating accident and consequent osteomyelitis. Mundus does not suffer fools gladly but he happily took them fishing for a price, among his more memorable guests having been a gentleman who dreamed of catching a whale and depositing it on Broadway and 42nd Street, and a sport who got a thrill out of shooting bullets into a dead mako shark. "Frank says he was born an 'idiot magnet,' " Drumm announces cheerfully. But elsewhere the author takes a darker view of the hordes attracted to Mundus's discovery of shark-fishing as a sport. "The hole in the bloated suburban dream opened by 'Jaws' was the catalyst that would spill a multitude onto the sea in a blind escape for which most were unprepared," he writes. "Today, just as Frank's about to hang it up, ignorance of the deep is no longer an obstacle. It's virgin territory for endless sales of gadgets aimed at making the sea a comfortable place." Which it can never truly be, his passionately pessimistic book implies. A release accompanying In the Slick of the Cricket announces that "this book was rejected totally by all publishers" before Pushcart Press gave it "our Editors' Book Award for overlooked manuscripts of enduring value." If the volume suffers from any lingering sense of rejection, it should feel compensated by the unusual handsomeness of its design, with its interleafing of evocative black-and-white photographs and pages with pungent quotations. One from Captain Mundus himself nicely captures the book's tart message: "Nothin' on this earth is increasin'. There ain't as many fish, but there ain't as many of a lot of things, like pheasants or buffaloes. Even the brontosauruses that used to hang out on the front lawn got scarce after I quit drinkin'. The only thing there's more of is humans, and some of them ain't human." Illustrated. 315 pages. Pushcart Press/W.W. Norton & Co. $25.